Here’s a joke for all you middle-schoolers out there. How are doctored images like bad pennies? They keep cropping up! Here’s the latest one we’ve picked up: Lung Cancer has retracted a 2014 paper on the genetics of tumors after concluding the authors cribbed a figure that had appeared in a 2005 feature story in Science. The image was originally published in a 2004 paper by Fevrier & Raposo, to which the Science article indeed refers (“Exosomes: endosomal-derived vesicles shipping extracellular messages”, Current Opinion in Cell Biology: http://www.sciencedirect.com/science/article/pii/S0955067404000729 => Figure 2, right panel). This article has been retracted: please see Elsevier Policy on Article Withdrawal (http://www.elsevier.com/locate/withdrawalpolicy). This article has been retracted at the request of the Editor in Chief. Figure 3C has been composed by cutting and pasting from a figure which was published in a paper in Science in 2005 by Jennifer Couzin titled “The Ins and outs of Exosomes”. The 2014 paper has been cited six times, according to Thomson Reuters Web of Science. The authors, led by Yili Wang, are based at Xi’an Jiaotong University in China. It never fails to awe me when people can recognize images from different sources. Especially in this case when they were published nearly a decade apart. This is a very odd case of image manipulation. If the experiments were indeed performed, including a few micrographs isn’t a big task by itself. Why go through all the trouble of photoshopping a figure from an old Science paper, moving cells about in a clever way, and hiding the cuts? There is also no analysis done on the image itself, it seems to be purefuly illustrative. It just doesn’t make any sense. Is it possible the similarity is by sheer coincidence? 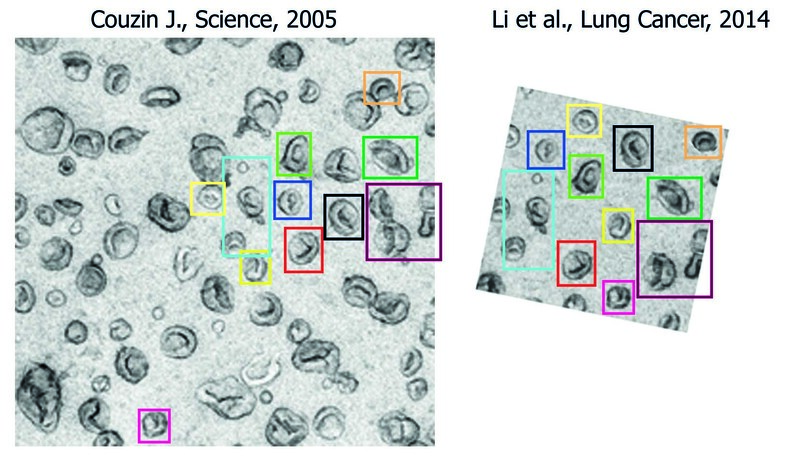 After all, how many different shapes of exosomes can one find in an average micrograph? 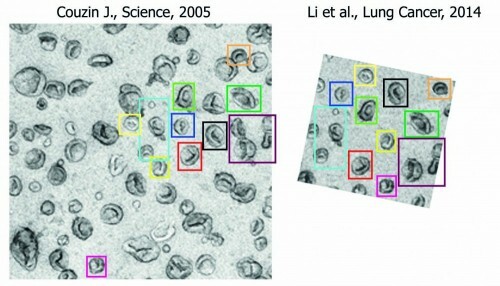 In the large micrograph from the Science article, I don’t see any two exosomes that are the same, or even close to the same (there are a few small featureless circles but I’d guess they’re bubbles). Yet the large image and the small one share 11 regions, including some that contain more than one exosome. I do share your complete puzzlement as to why anyone would do all that work to make a figure. Perhaps it was made for some other purpose (Photoshop practice?) and then shoved into the paper? We’ll probably never know. But I don’t feel any doubt that it’s falsified. I also share the other poster’s amazement that the problem was spotted. I’d guess the anonymous complainant had some connection to this image–being able to do it as an outside observer would be astonishing, though I guess you could have happened to read the two papers back to back, which would help. I agree it is a crazy thing to do – if you don’t have an electron microscope just don’t show any images! Especially when they aren’t used to generate data. Pretty impressive to spot that though. Like TinEye reverse image search for articles (https://www.tineye.com). Wonder how difficult it would be to create?